Christina Korines, 33 years old, has a Young Onset Parkinson’s disease. She showed her first symptom when she was 22, which started with a tremor in her foot and soon after progressed into a very obvious limp. Christina waited almost ten years before receiving her diagnosis. She was finally diagnosed in October of 2017 after seeing 5 neurologists over the past decade. Christina married her highschool sweetheart and have two beautiful daughters together, ages 2 and 6. John L. Lehr brings to the Parkinson’s Foundation more than two decades of nonprofit fundraising and management experience, with a strong focus in the voluntary healthcare and medical research sectors. Before joining the foundation, John served as President of Orr Associates, Inc. (OAI), a consulting firm that serves the nonprofit sector. At OAI, John was responsible for daily operations of the firm, as well as management of leading clients including Georgetown University, MedStar Health and Special Olympics. Previously, John also served as Chief Executive Officer of CureSearch for Children’s Cancer, a national research and advocacy organization. 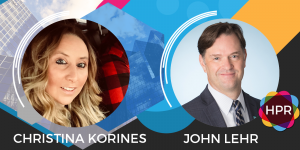 Segment Overview: Christina Korines, diagnosed with Young Onset Parkinson’s Disease in 2017, and John L. Lehr, CEO of the Parkinson’s Foundation, talk about her case, and how the foundation is making life better for people with PD; by funding the largest network of comprehensive clinical care centers worldwide, serving as the leading funder of training for neurologists who specialize in Parkinson’s, and conducting the largest-ever clinical study of Parkinson’s. Neal Howard: Welcome to Health Professional Radio. I’m your host Neal Howard. Glad that you could join us today. April is Parkinson’s Awareness Month. Kind of a renewed sense of urgency to help raise awareness about Parkinson’s disease and hopefully to find a cure. With us today are Christina Korines, diagnosed with young onset Parkinson’s disease a year ago and with returning guest Mr. John Lehr, CEO of the Parkinson’s Foundation. They’re joining us to talk about her case and how the foundation is making life better for folks with Parkinson’s disease or PD. Welcome to the program both Christina and John. Thank you so much for returning. John Lehr: Thank you very much. N: Parkinson’s Awareness Month, how long have you been involved with Parkinson’s Awareness Month as CEO of the foundation? J: April is the month in which James Parkinson first identified Parkinson’s disease, 200 plus years ago. The foundation has acknowledges it along with a lot of other Parkinson’s disease organizations and it really is a key time for us to just talk about Parkinson’s and raise awareness of the disease that affects more than a million Americans. N: And you being one of those affected Christina, how does your Parkinson’s diagnosis differ from other Parkinson’s diagnosis? Christian Korines: I think everybody’s diagnosis is gonna be individual to them. I know for me it was difficult getting one because I have a two year old and a six year old and I’m 33 and you have such a long long life to live so you get it and you’re like, “What is my life going to be like?”. I have such like a long long time with this and you learn to live with it. You try to make it positive and you make the best of what’s in endowed to you. N: So it’s called the, “Young Onset or Early Onset Parkinson’s,” is that the differentiating factor there? C: Yes. I’ve heard them both used. N: So basically, you’re just living your life and you started having I guess some of the classic symptoms of PD? C: I did. And when I was 22, so about 11 years ago, I started with a tremor. And my boyfriend who’s my husband as of now, he started noticing that was progressively getting worse and I want to say, I think at least five or six neurologists and then finally last year, last October, I went to NYU in the city and I finally got my diagnosis. But I have all the classic symptoms an older person would have with the same disease, tremor, difficulty walking, sometimes my sense of smell doesn’t work, any classic symptom that an older person would have as Parkinson’s, I have it as well. N: Now, I’ll get right back to you with basically the question that I’m going to ask John. In your opinion, what is it about Parkinson’s that caused her to be diagnosed so far out from the first I guess maybe year of noticing problems, John? J: Christina’s case is very unusual. The number of people who have young onset or early onset Parkinson’s is less than 10%. So we are doing everything we can to understand why somebody like Christina would end up with the diagnosis. It’s unusual and she’s bringing the right attitude and the right spirit to it. She’s doing all sorts of great things to keep herself healthy like exercising and boxing and she’ll probably tell you about that. But our goal at the Parkinson’s Foundation is to help develop new therapies both clinical therapies and new medications so that people like Christina and anybody diagnosed with Parkinson’s can live life to the fullest. N: How has some of the networking efforts that you’ve been involved in help folks? J: So we, the Parkinson’s Foundation has a what we call our Center of Excellence network. This includes 42 institutions, some of the best academic medical centers in the country where we’re collecting patient data in a database called the Parkinson’s Outcomes Project. This is allowing us to look at the care and the outcomes of individuals like Christina over time to discern better treatment modalities and then to raise the standard of care and disseminate that broadly, so that when Christina goes into a doctor’s office, he or she, the doctor is providing her with the best standard of care, the most up-to-date therapeutic. N: Christina, when you were going to your doctor or doctors, was there something that caused them to may be misdiagnosed or not catch certain things or maybe dismissed certain things that you and your then fiance, now your husband were trying to tell them? Was that something that was going on? C: I think the difficult thing about Parkinson’s doesn’t show up in any testing. There’s no like images that will show up with it. There’s no blood work that you could really do. And I was 22 and I remember, I went to this one neurologist and I walk in and he’s like, “Well, I could tell you it’s not MS but I can’t tell you it’s Parkinson’s. I can tell you if it is, you’d be in the Guinness Book of World Records.”. He kind of made a joke about it and I’m like, “Well, that’s not very comforting.” and then I must have heard that about two or three more times and then finally when I went into the city, my doctor, he saw me walking in and I saw him stop and walk behind me and I’m like, “Why is he watching me walk like this?”. And he knew right away and I think the difference is and I don’t know if this helps any other people who are going through this is, I saw a general neurologist and then I went to a movement disorder specialist which was this incredible doctor who specializes in these disorders and he saw my tremor and right away he’s like, “This is Parkinson’s.”. And I think it’s just a matter of finding someone who specializes in what you’re going through. N: Now obviously, a huge impact on your personal and your social life, you used to teach a middle school and I understand you’re engaged in a little bit of boxing now or maybe a lot of boxing. Talk about that just a bit. C: Oh my goodness, I always say, it’s the only time I feel normal. I started boxing with this trainer. His name is Mike Cooper and he’s fantastic. And he watches me from the parking lot, and said, “You’re limping today.”. And he’ll make sure that I walk out of there and I’m not limping anymore. He works with me one-on-one and he uses these mitts and he’ll call out combinations. And it’s the only time, Parkinson’s slows you down and he’ll tell me, “You’re so fast today. You’re so fast today.”, and it’s awesome that you feel and I use this term all the time, my husband’s like, “Why do you say that?”, I’m like, “I feel normal.”. I remember one time I said in front of my trainer and I said, “I feel normal today.”, and he’s like, “You are normal.”. He’s said, “Don’t ever say that to me again.”. It was just great because he doesn’t treat me any differently. He pushes me and it makes me feel like I don’t have this. It’s something that feels like you’re dragging your body with the boxing and you just feel incredible. N: As John mentioned earlier, nearly a million folks here in the United States alone are living with PD. This number is expected to rise quite a bit by the year 2030 to 1.2 million people. John, where can we learn more online about Parkinson’s disease and the Parkinson’s Foundation? J: Thanks. You can go to our website which is parkinson.org or you can call our helpline which is 804 PD INFO, that’s 804 PD INFO (804-473-4636). N: Cristina, John, a pleasure. Thank you Christina for joining us today. John, thank you for returning. I’m hoping that we’ll talk to both of you again in the future. N: You’ve been listening to Health Professional Radio. I’m your host Neal Howard. Transcripts and audio of this program are available at hpr.fm and you can subscribe to this podcast on iTunes, listen in and download at SoundCloud and visit our affiliates page at hpr.fm.